. . . who is due to arrive any day now! and then I used a Kaffe print for the binding. Not too sure whether our next grandchild is a boy or girl, but I'm all ready now. Life has gotten pretty busy around here these past few months, not much time for sewing. - it feels like a loosing battle! I began yesterday by sorting this bundle out by colour, with all the blues first.
. . . do I stop sorting & start sewing a new scrapbin quilt instead? I'd love to hear how you tame your scrap pile. let's get straight into another fortnightly 'Sew, Stitch, Snap, SHARE' linkup. 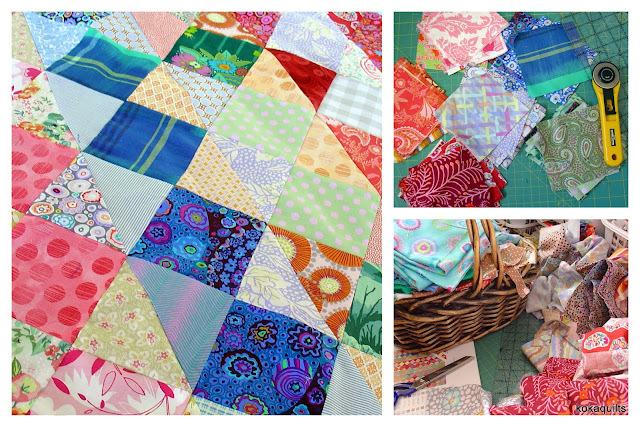 Her latest WiP is a fun string quilt using lots of different pink shades mixed with a little bit of grey. Sometimes sweet & simple is just about right, yes? 1. Link up any post from the past week that features something you have been sewing or stitching, whether they are WiPs or finishes. You can write as much or as little about your project as you like, or simply let your photos do the talking. Glenys & I had a lo-o-ong overdue catch up today. She has recently retired and she showed me all the projects she's been working on. First up, her 16 patch blocks all in yummy Anna Maria Horner fabrics. and I think she said she was planning on making about 30 blocks in total . . .
there's an Anna Maria sewalong happening over on IG at the moment. Pop on over here to see heaps of other lovely AMH projects. Her 'mum elephant & baby' quilt just needs the binding stitched down. Isn't this so sweet in a pink & grey pastel pallette . . . It would seem elephant quilts are very popular. I did a search and found this, a whole parade of them! but is taking her time, enjoying 'the process' and the memories . . . 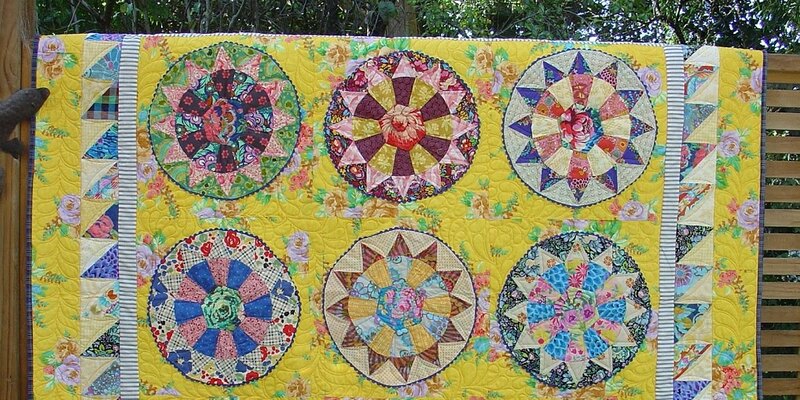 This is a large quilt that Glenys has just finished. It was a fabric pack, not her usual colours but she's had fun putting it together. see here for the free pattern. Loving all the bright mod fabrics! 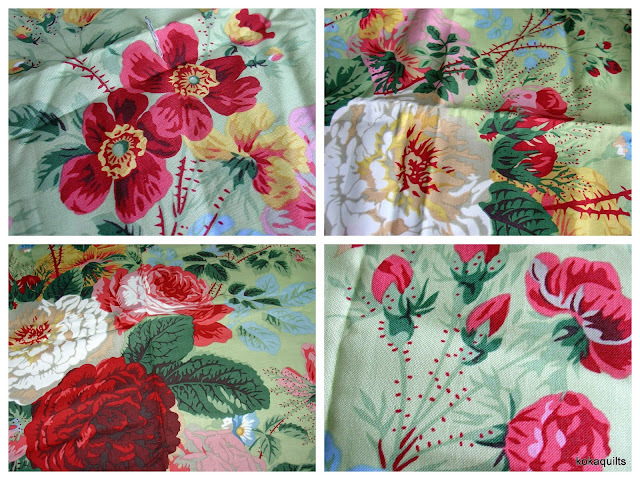 Ever find a fabric, one that you want to use in just about everything? Well, this is my latest favourite find, "Gradi Flora" by Phillip Jacobs for Rowan . . .
. . . and it was hiding in my stash all this time! 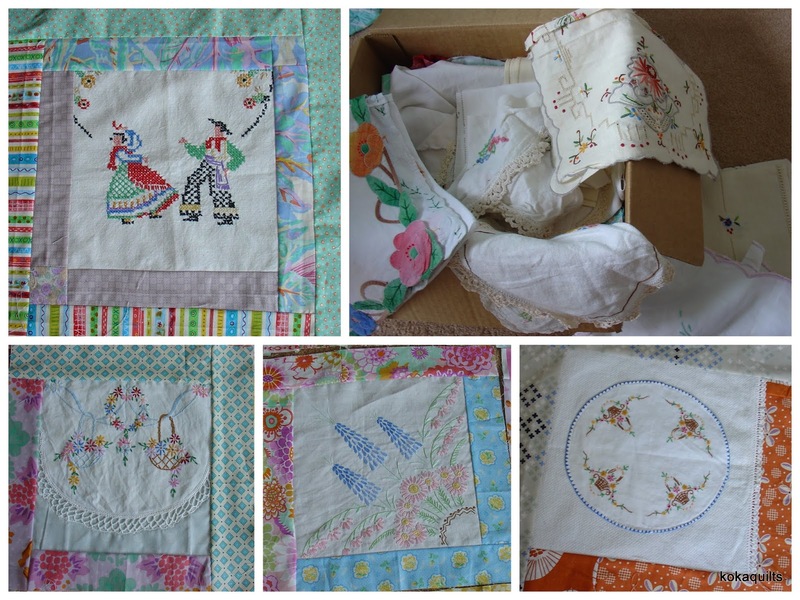 and now have one more 'whimsy' block to add to my collection. 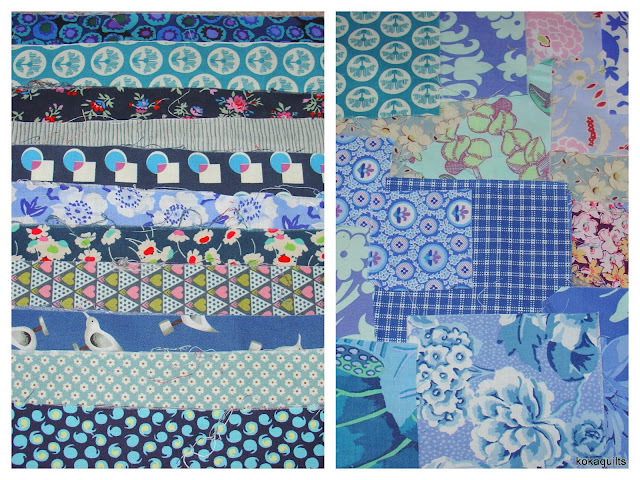 And how about you, is there one favourite fabric you tend to use over & over? I used a Kaffe pattern that I'd admired for some time now, 'Ebay on Point' from his Caravan of Quilts book. 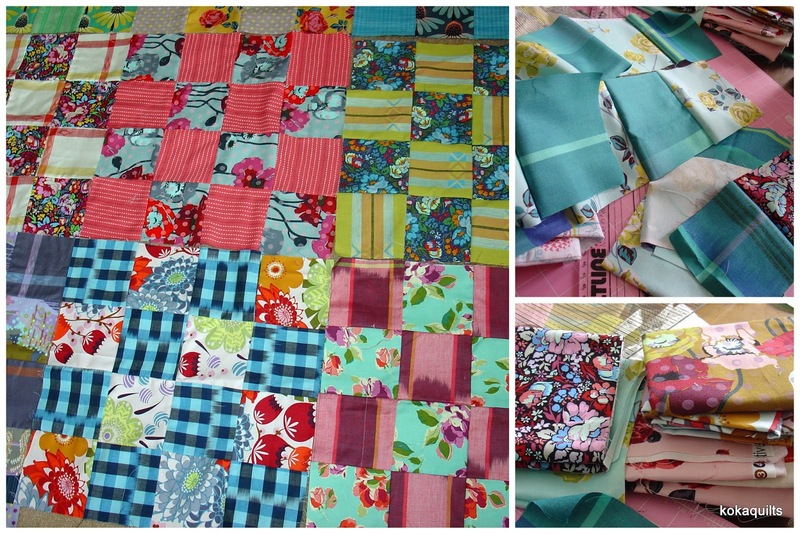 Lots of fun using this eclectic mix of fabrics- Kaffes, spots, checks & stripes, AMH, lots of other little bits of Amy B., Jen Kingwell, Denyse Schmidt, outback wife, and some smaller scale reproduction fabrics. I had a little play on the 'design floor' today, just to see how the blocks were looking all together, and I also wanted to check out how the borders were going to go, have a little look . . .
16 blocks down, not too sure how many to go yet but I'm very happy with these so far. 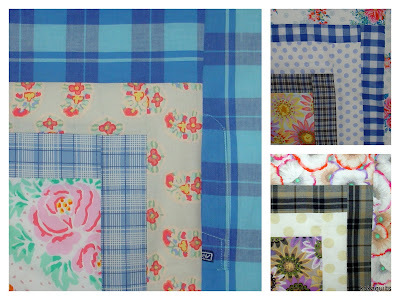 Have a closer look at Susan's fussy cutting, such a great use of fabric. Pop on over here to see lots more & be inspired. We are trying to encourage people to read blogs and to keep blogging. I hadn't intended sewing today, lots of gardening took my initial attention. However, Leeanne from quiltmekiwi kindly sent me a few extra plaids, and they arrived today. 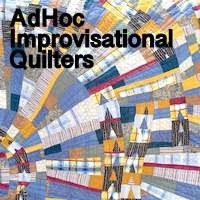 They were all shirts bought from Op Shops, washed & dismantled to 'one day' be made into quilts. 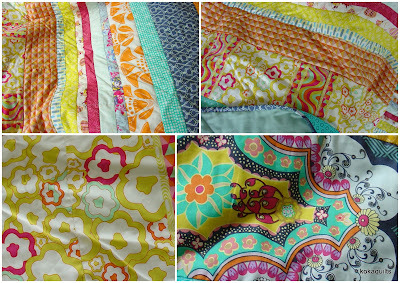 So I popped into the sewing room for an hour or so late this afternoon and made a few more blocks for my handkerchief corner quilt. And don't those shirt plaids mix in so easily with all the other Kaffe pastel prints? Interestingly, there are many versions of this block, and with just as many names too - 1/4 log cabin, handkerchief corners, and Ann from fretnotyourself added a few more - half log, housetops (her favorite), improv log. At present I have 20 blocks set 4 x 5, but am going to go a bit bigger . . .
it's fun trying to combine this unlikely mix of fabrics!